I’ll be at the annual Hamvention at Dayton again this year, for a short time so my last order time for dispatch before I go will be Thursday 17 May at 10:00UTC. I’m back on Monday 21 May, so not a long trip. At the AMSAT/TAPR dinner on Friday evening, I’ll be announcing details of a new SDR project we’ve been working on over the past few months which I hope you’ll think is very, very cool. I hope there will also be a web announcement about the new SDR project. So, the new SDR project is a tablet-based front end for the FCD, and possibly other SDRs too in the future. I still have a bit of work to do on this to make it primetime, but as you can see a lot of the work has been done. -which sdk did you use for the iOS development? I use Marmalade for all platforms. http://www.madewithmarmalade.com . I’m not sure yet whether it’ll be open source or not. Looks fun specially for using it as a remote RX at another location.. any idea when it will be available for everyone to try? I would give it a couple of months all being well. I have a problem with the OpenWrt MIPS kernel at the moment which is not properly writing to USB HID devices for some reason with an ioctl failing. It works in x86. Burnt all last week on that. 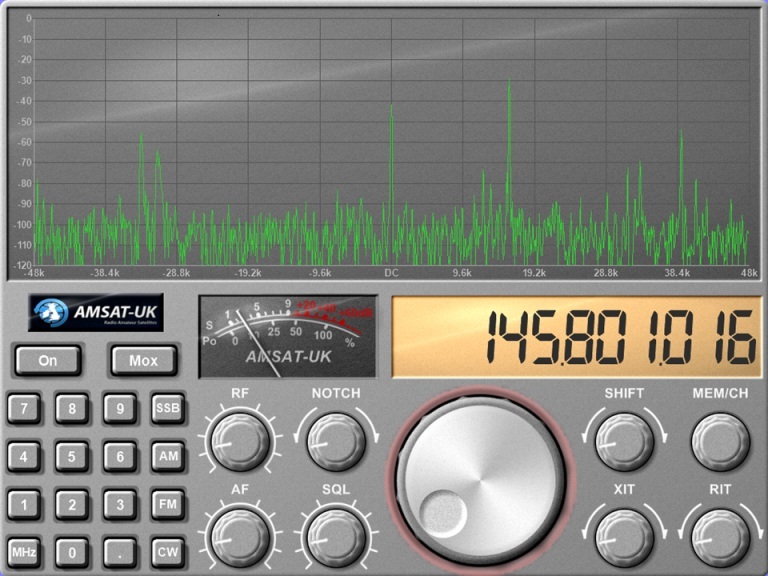 The streaming of the full 96kHz works very well. Getting it to work on Android devices without hardware floating point is proving a challenge too. I have recoded almost everything to fixed point as a result, but that has its own problems! That looks interesting, I could not make Dayton this year. The WiFi interface via that little OEM board is a great idea as there is then no special reason except bandwidth and a supply of power to limit the utility to a local device. I am looking forward to trying it. I am using it as the platform for the time being. If you like hacking embedded Linux, I can recommend it with or without an FCD! As a relatively naive Linux guy (have used it on and off for 15+ years, but it’s never as my main OS), I found the instructions for building a cross-dev environment for it very easy to get working compared to any other Linux cross-dev board I’ve tried before (eg, Chumby, Beagleboard). I use Ubuntu in a VMware VM for it on a Windows 7 host. What version of Android will this run on?, I’d be very interested if it runs on 2.1. I have it running on Android 2.2 and a number of versions after that including 3.1, 3.2, 4.01, 4.02. The 2.2 device I have has no FPU which has forced a recode of a lot of the SDR code into fixed point. I’m not guarantteeing yet that it’ll work reasonably on devices without FPUs, there’s a lot of work to achieve that. There are a lot of low end devices without FPUs, or with a VFPLite cut down FPU which are non too swift at floating point. The framework I am using will support down to Android 1.6, but I don’t have such a device to try it on. Aargh!! Amateur radio in a tablet. There went my last argument against ’em, now I’ll have to find a turn-around excuse to acquire one for myself in addition to one for the wife. Wow, I just ordered an FCD. 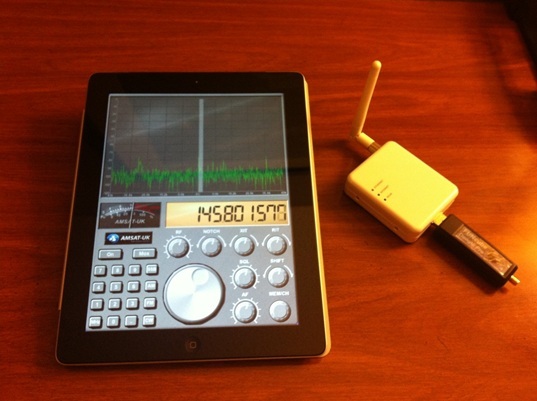 And now my dream of an SDR on my iPad is coming true. Yes, this has been quite hard work, in fact the project started in October and I’ve been working on it on and off since then as time allowed. As it stands, it’s not possible to use an FCD directly, you need some glue in between for different reasons. a) iOS only works with audio up to 48kHz, the FCD is 96kHz. b) To get USB Host mode, you need a Camera Connection kit, but there is a current limitation fo only ~20mA, so the FCD would need to be self powered anyway. b) There is no support at all for USB Audio class, and USB Host support is patchy across versions. The common denominator is either Bluetooth or WiFi. I discounted Bluetooth because there is insufficient bandwidth to support SDR unless demodulation or at least some downsampling is performed on the SDR hardware itself. WiFi was the next option, and while this makes it supportable cross platform, it is not perfect: unlike iOS, Android does not support ad hoc networking so either you thee an access point or the SDR has to work as an Access Point itself. Not a problem for operating at home, but portable it’s hardly convenient to require an AP as well. More generally, WiFi modules for microcontrollers at the moment typically have nowhere near enough bandwidth, typically peaking at 1Mbps, but often much less: you need at least 3Mbps sustained to support 96kHz. That is why I’ve been using the embedded MiniEmbWifi module which is a wireless router device in its own right. The MiniEmpWiFi module looks like a good solution. It would be nice if Apple and Google stop quarreling and started standardizing thinks. P.S. I’m the head Antenna Engineer at Mobile Mark Antennas, if you need any antenna support feel free to ask. AdHoc ( for Android devices ) apparently is being replaced with something called WiFi Direct… a friend of mine recently got a wireless link running to an Android tablet via WiFi Direct using a demo module from a company called RedPine Signals. It seems lots of people were using AdHoc to tether multiple devices together to dodge network service charges, so the industry came up with this new stuff. The RedPine module can operate as a hotspot, and would probably do the job. I have looked at the RedPine solution some months ago, I can’t remember why I discounted them, whether it was for bandwidth/price/other reasons. However you are right, Android is moving to WiFi direct. AdHoc is so rarely supported on any Android devices that it was discounted early on as an option for that platform: in fact mostly it seemed that you needed to root the device to make it work if it worked at all, not something I’d say was viable as an acceptable option. However iOS does support AdHoc very well, so it means multiple options need to be supported. Unfortunately!!! Wow this is actually what i had in mind for my android device, FCD control at a distance. So the last update was in June. It is not September. Any more news? My portable devices are itching to get SDR up and running. Unfortunately other things beyond our control have taken precedence. We have a satellite launch in a few short months with the possibility of no ground segment due to a supplier going into liquidation. For the past two or three months all my efforts have been asserted into making sure we still have a geound segment, hence the announcement of the forthcoming FUNcube Dongle Pro+. That had to be the priority. Believe me I am as frustrated as anyone! This was not what we had planned. Once the dust has settled on the updated FCD Pro+ release, rest assured, I will be returning to the mobile app development. It really is sweet! I hope that you can understand that sometimes we have to reprioritise things in life due to circumstances beyond our control. I quit my day job to get the FCD Pro+ out in time as a not-to-small example! That should have said now September vice not. Autoco-wrecks again. Having spent 42 years as a spacecraft electronics systems/subsystems integration and test engineer, I have felt your pain. Good luck on the launch. I would be happy to help if I could. Retirement is not all fun and games. I will be sending all my best wishes. quel logicilel simple puis je utiliser ? Howard any updates ?, know you have been rather flatout. Would you be willing to share you prebuilt linux image ? and the app maybe via testflight for testing. testflightapp.com (brilliant service). I’m sure there are more than a few of us willing to give it a go. Because of the unexpected redesign of the FCD over the past few months, this project is on a temporary hold I’m afraid. However longer term this is definitely a project I’ll be restarting in the new year all being well. Ist this App still available ? Where i can get it ? I have never released it, as I’ve spent most of the past year getting the FCD+ up and running instead. I have recently restarted work on it though, so soon we’ll have something ready. If you’d like a beta tester, I’d love to help out– I’ve been an Apple iOS Developer for years, and I was just earlier today wishing I had some way to hook my FCD into my iPad…. One of the difficulties I have is the whole cross-platform thing: iOS supports things that Android doesn’t and vice-versa! It’s a pain. Initially I looked at something that physically hooked up to the iPad/iPhone, but you have no choice but to join the MFi program, and after many weeks of getting nowhere with Apple I realised it would be better to go another way. Their introduction of a new connector only reinforced that opinion! In addition, the USB port is restricted to 20mA in host mode, so you need a powered hub anyway for FCDs. On the Android front, it has no USB Audio class drivers and OTG or USB host ports are not universal. 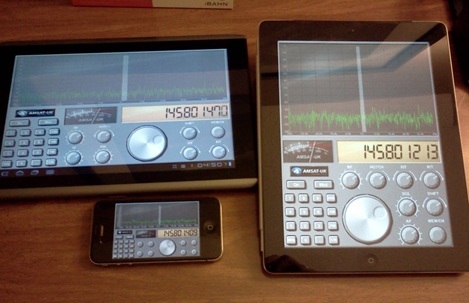 For audio-in purposes, almost no Android devices have stereo, essential for a softrock-style interface. Bluetooth has insufficient bandwidth, hence WiFi. But, unlike iOS/Windows/OSX, Android doesn’t support adhoc networks without rooting, you need an AP. So lots of work was done on this about a year ago, and nothing has changed on the iOS and Android platforms that makes me change my mind on using WiFi for this. Howard: Any further updates on the progress of this app? It looks VERY interesting and innovative. Very good to hear from you. Although I’m back working on this now, progress came to a standstill when the second generation FCD was developed and launched. I had no intention of developing that second FCD, but a parts supply problem meant I didn’t have much choice or there’d be no bread on the table! The tablet project itself has turned out to be a much bigger one than I ever anticipated. I have been working on the hardware for it, but it is slow going. There have been lots of mountains to climb, both technical and non-technical in the brave new world of tablets. This includes making the device work across multiple platforms as well as the need to have software that passes the various Store tests, and in particular Apple’s MFI hardware program (Made For iPod/Pad/Phone) where you have to get lawyers on board. That latter point makes it very challenging. So progress is being made, albeit slowly. I am looking at the first fit-test prototype of the enclosure hardware as I write. The various technology components, both hardware and software, have been largely unit tested, and I’m about to start putting it all together. But this is a much more complex project than I ever imagined so we’re quite some way off a finished product.